Mazzei Injectors (patented) are extremely efficient, compact differential injection devices. Currently operating successfully in thousands of installations worldwide, Mazzei Injectors offer a reliable, accurate, and economical method to inject virtually any liquid or gas substance into a pressurized fluid stream. The highly versatile Mazzei Injectors are suitable for a wide variety of applications. 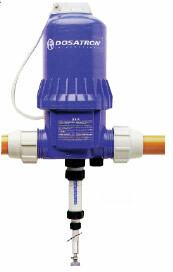 Ag Irrigation Systems – to inject fertilizers and other chemicals or water treatment additives. Ag Spray Systems – for mixing and/or the transfer of concentrated pesticide materials. Food Processing – for water chlorination, injection of detergents, bacterial agents, other water treatment purification additives. Water Treatment – to inject air, liquids, gases (ozone), and other water purification chemicals for cooling tower or other water or fluid recirculatory systems, waste water systems, potable water systems. Washing & Cleaning – to inject detergents, solvents, and other cleaning agents into carpet cleaning equipment, car wash systems, dishwashing equipment and other industrial cleaning processes. Molded from high quality thermoplastics with superior strength, high temperature capability, resistant to most chemicals. 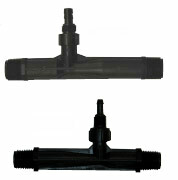 No moving parts, low-maintenance trouble-free operation. Ideally suited for continuous mixing functions, require no secondary blending devices. Powered by the motive fluid, no external energy required for most instllations. 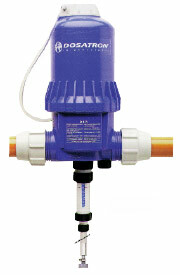 Available in a broad range of sizes, flows and injection capacities. 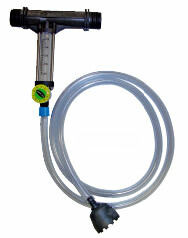 Used to inject liquid chlorine in greenhouse, open field and landscape watering systems. 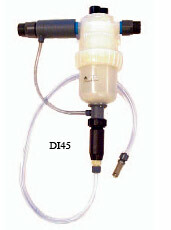 Used to inject to inject soluble or liquid fertilizer in greenhouse, open field and landscape watering systems. Used to inject soluble or liquid fertilizer in greenhouse, open field and landsacpe watering systems. Built in sight glass flow indicator. Control valve to throttle amount of fertilizer. Body – Polypropylene for resistance to acids and other chemicals. Minimum working pressure on pressurized systems must be 98kPa. When using on by pass pressure differential between the inlet and outlet must be at least 70kPa. Venturi should always be installed on level plain.